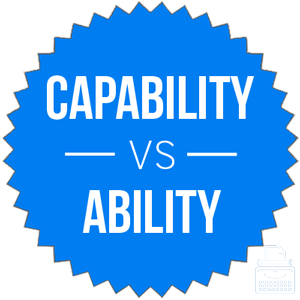 Capability vs. Ability – What’s the Difference? Home » Capability vs. Ability – What’s the Difference? You might not enjoy it very much, but it is probably possible for you to stay up all night should you have a lot of work to do and a deadline is approaching. Is this an ability, or a capability? These words are so similar that an argument could be made for either. In this particular example, most writers would agree that capability is a better fit. I’ll show you why. What is the Difference Between Capability and Ability? In this article, I will compare ability vs. capability. I will use each of these words in at least one example sentence, so you can see how they appear in their proper contexts. I will also show you a mnemonic device that makes choosing ability or capability a little easier. What does ability mean? Ability is a noun. It refers to possession of the means or skill to do something. Someone with superior athletic abilities is very good at sports or other physical games. A writer of great ability is considered to be an excellent writer. In both cases, ability is used to refer to the qualitative nature of the person. My ability to mow the lawn is dependent on my access to my neighbor’s lawn mower. Research shows that, on average, men are likely to have stronger spatial reasoning abilities than women, although psychologists disagree on the cause and degree of this difference. As I mentioned above, ability is considered a qualitative marker, not a quantitative marker. To again take our above example, if someone were a writer of great ability, this would mean that he or she could write well. It makes no comment on the amount to which he or she can write, only to the quality of the writing. This is important to note: ability is a qualitative marker. What does capability mean? Capability is also a noun, and it also refers to the ability to do something. The difference between capability and ability is usually one of pragmatics. Capability usually refers to either/or propositions in a potential scenario: a corrupt regime may have nuclear capabilities. It can either launch nuclear missiles, or it cannot. A fighter jet may also have stealth capability. It either has this capability, or it does not. In this sense, capability is a quantitative marker. Our long-range missile network gives us first strike capability around the world. People who are telekinetic have the capability to kill you with their minds. Ability, meanwhile, usually refers to skills, which can have degrees. Your ability to learn new languages might be stronger than mine because I have not fully developed this skill. Capability, on the other hand, usually refers to either/or scenarios. My car either has the capability to go 200 miles per hour or not. There is no degree or continuum involved. Either it has that capability, or it does not. Another similar word, capacity, usually refers to an innate potential for something. Humans are born with the capacity to understand and use social language, for instance. While some of us may develop this skill to a higher degree than others, all of us are born with the capacity for it. Capability and capacity are much more related than capability and ability. These words are similar enough that a casual reader might accept either of them in most contexts. Indeed, in sports journalism, military strategy, and other situations, many writers have standardized on one or the other even when its counterpart would technically be more appropriate. Still, there are certain constraints that make remembering when to use each a little easier. Capability usually refers to either/or scenarios, while ability is usually a question of degree. Capability vs. Ability Check: Since capability and potential each contain the letter P, it should be easy to remember that capability usually refers to the potential to do something in a yes or no context. Is it capability or ability? Both words refer to having the power to do something. In general, abilities can vary along a continuum; one person may be better at free throws than other person, for example. Capability is usually an either/or proposition; a country can either launch nukes or it can’t. 1 What is the Difference Between Capability and Ability?